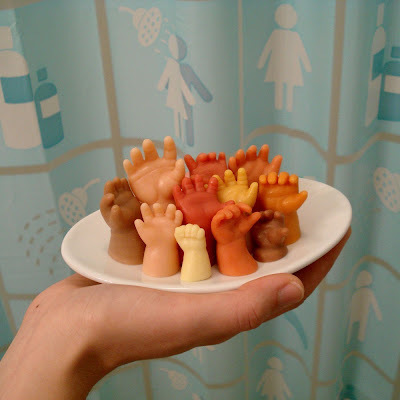 THE NEXT TIME YOUR WIFE ASKS YOU TO PICK UP SOME HAND SOAP, order these creepy beauties from a site I found on Etsy.com. The fact that they are “baby-sized” would definitely turn off a lot of people, but not in our house. We might not set them out when we are expecting a visit from our minister—but we don’t have much worry about that. 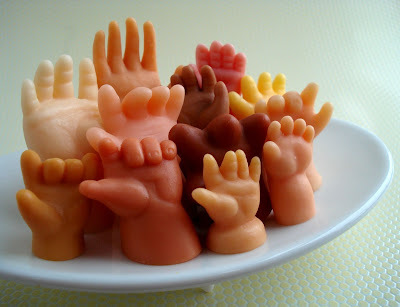 These “hand soaps”are are completely “hand-made,” so each set is slightly different with different hand-shapes & skin tones. 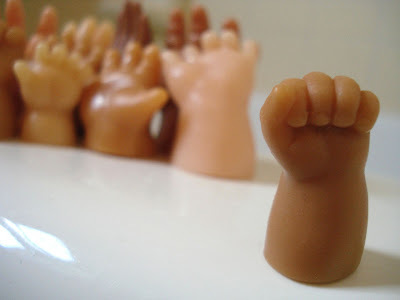 The soaps range from about 1/2” to 2 1/4” tall. 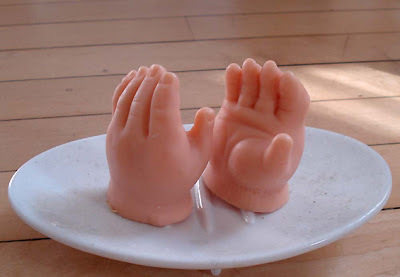 According to the site, you get at least 10 hands (at least/about 100 grams of soap). The soap is natural vegetable glycerin & has a very light scent. Order here, on Etsy, where artists and craftsmen sell their work. Nope - would freak me out ! I agree with Jan - that's freaky! Clever, but freaky. Must order some now, love the fist. I know folks... these aren't for everyone. The more I look at them, the more I think just too creepy. Creepy is right! I felt really unsettled as soon as I saw the first picture. I love etsy though! I can't imagine what your minister could possibly have against these... certainly none of the clergy I know would be offended by these.